On This 24th October Google corporation officially announced about their new smartphone , the Google Nexus 5 , which comes with top end specifications and Android 4.4 kitkat. The new handset is made by the LG Corporation, the new smart phone is slimmer, smaller, lighter when compared to Google Nexus 4 , but with a bigger touch display. The Google Nexus 5 is developed in such a way to know the capabilities of the new version of Android operating system ( Android 4.4 kitkat ) . 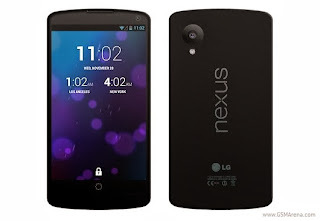 With the bigger screen when compared to Google Nexus 4 the phone will be available in 16 GB and 32 GB. This smart phone almost costs around $ 349 ( 16 GB ) - $ 399 ( 32 GB ). Android KitKat - the new operating system many new exciting features such as, caller ID crawls business numbers listed on Google maps , new screen-maximizing impressive mode, a built-in pedometer and much more. Faster- It functions much faster than the previous phones in Nexus series, processing speeds are now 2.3 GHz . Camera- An HDR + mode is the latest addition of Nexus 5 camera, the rear camera is 8 mega pixel while the front camera comes 1.3 mega pixel . Display- The 4.95 inch screen is an IPS LCD display that boats 1920 * 1080 resolution with 445 pixels per inch.